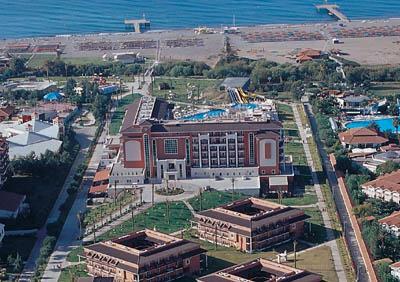 every 15 minutes departure of the bus from the entrance of the hotel) and 100 km from the airport of Antalya. Reception * lobby * four restaurants * four bars * outdoor and indoor swimming pools * water slide. 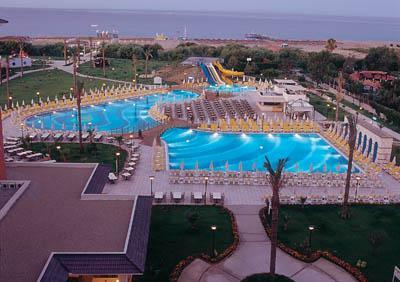 Tennis courts * table tennis * beach volleyball * sauna * Turkish bath * fitness * step * aerobic * water gymnastics * basketball * mini-club for 4-12 years old children * animation activities. Tennis courts lightning * rackets and balls * watersports * massage * peeling * billiard *game room *imported drinks * bottled beverages * fresh fruit juices. 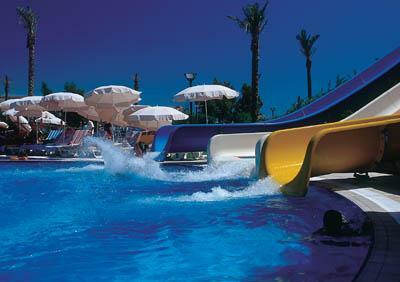 Air-conditioning (individual) * balcony * minibar * satellite TV * bathroom with hairdryer * carpet * telephone * safety box. Air-conditioning (individual) * balcony * minibar * satellite TV * bathroom with hairdryer * telephone * safety box. 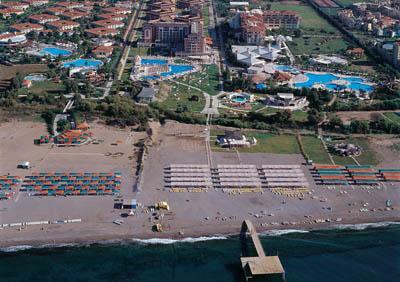 The hotel is situated directly on the private sandy-pebbly beach. Sun beds, umbrellas and mattresses free of charge. Open buffet breakfast, lunch & dinner. Late breakfast, coffee break, snacks at the snack bar (12.30 - 16.00), midnight soup.